14/4/2018 – Daryl Shpak pointed out that it’s not just age that might limit the familiarity of the story context, so I reworked that section a little. Our review of Holding On: The Troubled Life of Billy Kerr was almost certainly an uncomfortable read. Just imagine how uncomfortable it was to write. At the end of finishing any of these posts I often think ‘Phew, glad to get that one done’ but rarely is it accompanied with a palpable sense of relief. I didn’t feel I could write an honest review of Holding On without cover the terrain I did. If there’s one word I’d like people to associate with Meeple Like Us, it’s ‘honest’. Or perhaps, ‘authentic’. We gave Holding On four stars in the review but this is one of those rare cases where I think a rating genuinely is meaningless. It’s a kind of game that I’d like to see more often regardless of how it makes me feel to play. As you might imagine, this teardown is going to have to address some of the things that were discussed in the review. There are minor spoilers throughout, but nothing that should impact on anyone past the first scenario. Where I reference stuff from later parts of the game I will do so as obliquely as possible. When explicit spoilers are present, I will hide them behind spoiler tags. 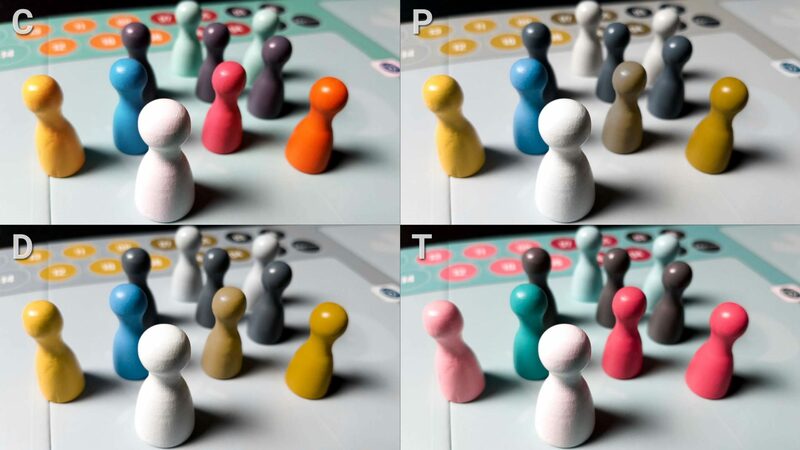 The colour scheme of Holding On has a few problems in this category, although they are confined entirely to the pawns. Yellow and Orange, Orange and Red, Turquoise (maybe?) and white are all problematic combinations for various categories of colour blindness. Close inspection will usually be enough to differentiate under good lighting conditions. In any case, these pawns are used only to indicate where a player has acted during the course of the day and it’s not an especially heavy burden on memory. There are sufficiently few clashes that it’s likely to be a workable solution to choose pawns based on distinctiveness at lower player counts. 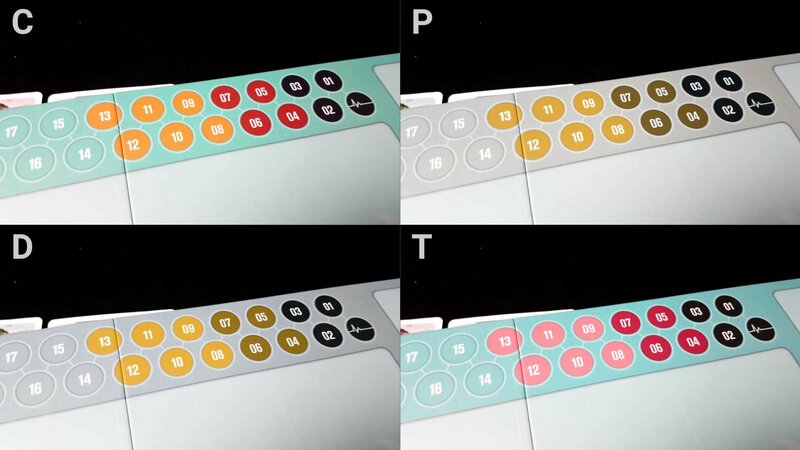 Replacement tokens could be used in any case and this would resolve the problem. It’s also worth noting here that pawns will begin to accrue stress markers that hang around their necks and that can serve as an additional channel of disambiguation. It’s not ideal, but it won’t get I the way of anyone playing. On the cards, there is a different icon used for stability and medical emergency, although in most circumstances it won’t be necessary to rely upon it. We’ll recommend Holding On in this category, although for large player counts some compensations will be required to ensure that everyone knows where they have been assigned in the day’s activities. 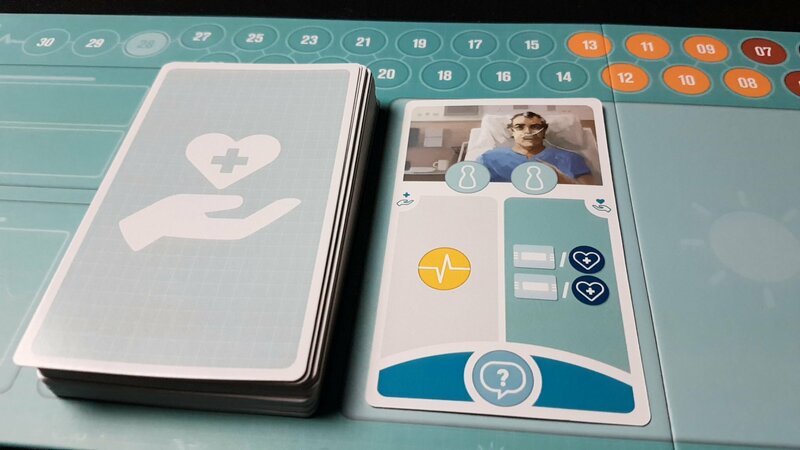 Holding On is a card driven game, and these cards are used to handle everything from clear and unclear memories, medical emergencies, and events that occur during inquiry. 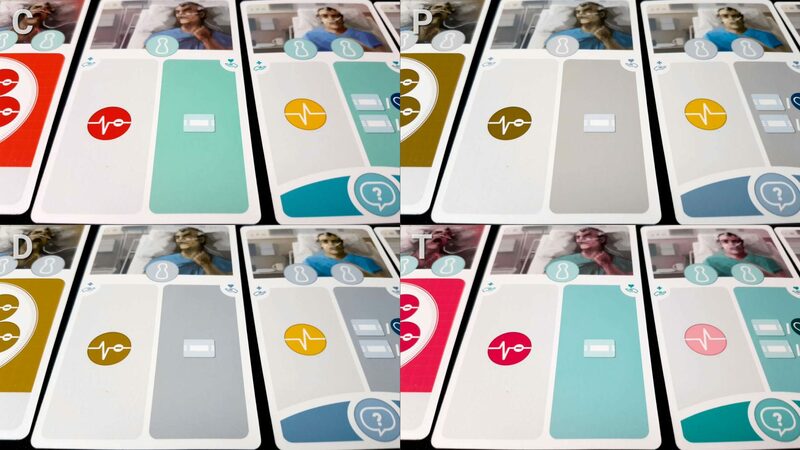 The shift cards are large, clearly contrasted and reliably structured. They are public knowledge in any case and can be reasonably easily verbalised. Physical presence of pawns conveys some tactile knowledge of assignments, as do the stress collars that pawns wear. However, there is a difference in how assistants, on-call support and normal medical staff behave – touch by itself won’t be enough to differentiate these. Provided a sighted player is at the table, that shouldn’t present too much of a problem. More problematic are the memory cards which come in clear and unclear versions. Each unclear memory card comes with a blurry picture of an incident from Billy’s life. It’s also marked with bars that represent the timeline to which it belongs, and in some cases a plus or minus sign that indicates whether it is a happy or sad memory. Those are not well contrasted in some cases, and close inspection of the timelines is often needed to make sure you’re working with the right number. When asking for someone to deal you out memories you are mostly referencing the back of the card which is much better contrasted. Often though this is a task of playing percentages – if you’re looking for a clear memory you will only keep it if it matches an unclear memory already in play. Clearly setting up the timelines below the board will be an important part of a successful strategy and this may introduce visual inaccessibilities. Again though, Holding On is a co-operative game and thus there is never a risk that comes with asking someone to resolve an ambiguity. However, once the cards have been played down there are other issues. 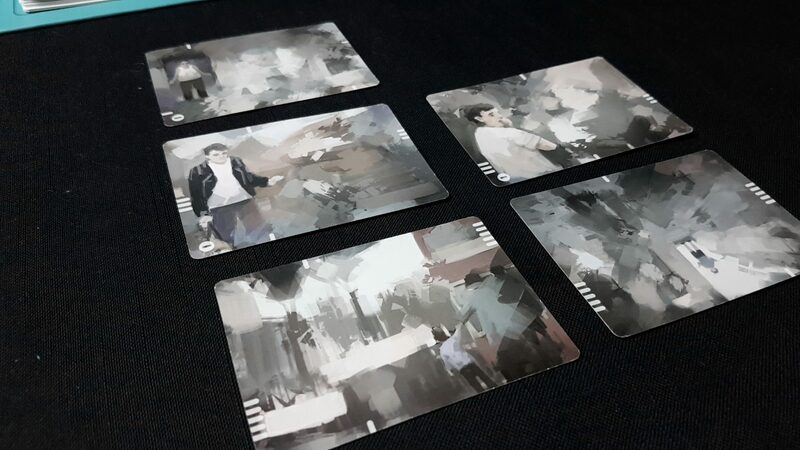 Some later scenarios require you to find specific memories and the scenario card that you use as a reference has very small versions of the necessary cards which must be mapped against unclear memories in a timeline. 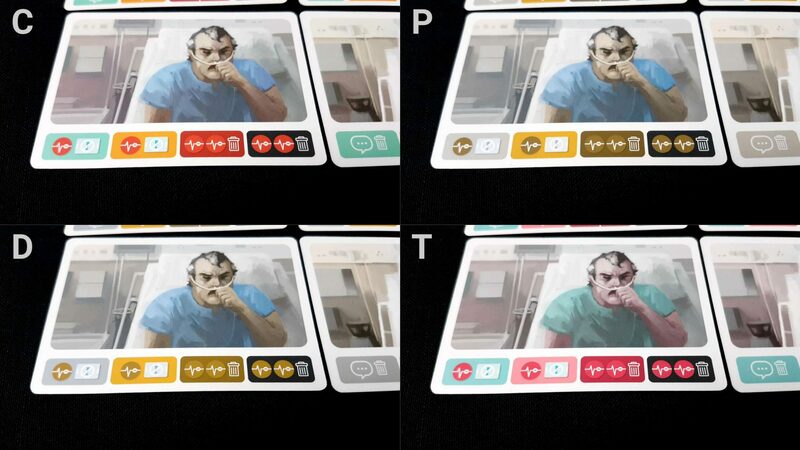 Knowing which timeline is best for what cards you want is a case of assessing blurs against thumbnails. Matching a clear memory to an unclear memory is often one of visual parsing, looking for dominant shapes in the unclear memory so as to see where it slots into the pattern. The marks along the edges of the cards can also be used for this but the lack of contrast in some circumstances makes this sub-optimal. For those with visual impairments, this might be a bit like having a multiplier on the severity of accessibility issues. Comparing an uncertain blur against another uncertain blur is hard enough without visual impairments adding more blurring on to the top. Since Holding On is a co-operative game a lot of the heavily lifting in this section can be done by sighted players if one is available. Decisions are easily presented to people for consideration. 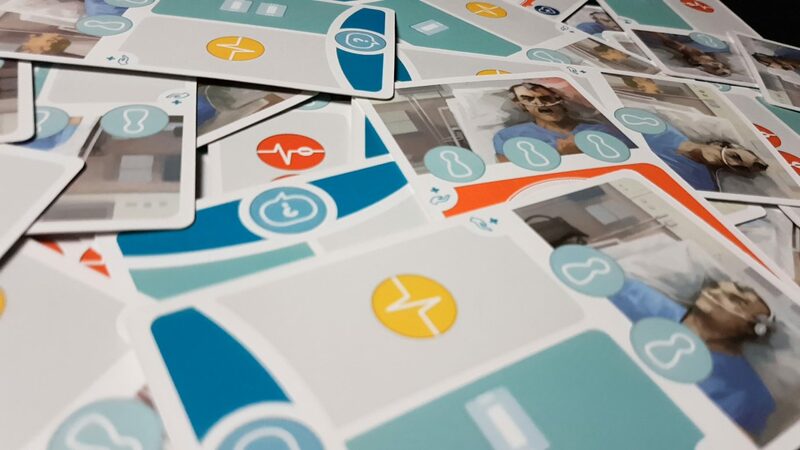 ‘Billy will lose three health if we don’t apply medical care, but the counterpoint is that we would get two care tokens and two memories if we leave him to suffer. He’s in a pretty good state right now – he’s on health twenty six.’. In fact, approaching the game narratively rather than systemically might even be a useful tool for building some empathy with the character and thus adding to the emotional heft of the game. All this said, we can tentatively recommend Holding On in this category. Decision making in Holding On is partially by group consensus but there is a rotating shift manager who assumes a greater amount of responsibility on that particular day of Billy’s care. The shift manager assigns staff and decides how to deal with personnel shortages. They also decide who is going to be the ‘senior’ member of staff, and that’s the one that actually takes the decision about how to treat Billy. As such, the complexity of decision making can be quite tightly tailored to the capabilities of a playing group. Discussion about decisions is common, and it’s certainly possible to play in a very collegiate manner with the shift manager / senior staff member acting as a rubber-stamp for group decisions. In normal game circumstances we might say that would lead to a risk of quarterbacking but we’ve spoken before about how such designs create for more cognitively accessible games. This approach allows for a lot of variability in cognitive cost provided there are appropriate players around the table to help contextualise what decisions mean. While this means some players won’t be as important as others, it also means they can be put in a decision making role when the consequences are least likely to be disastrous. Holding On is a reasonably straightforward game, but it does come with a number of strict rules that need to be taken into account. The board and cards do a good job of including lots of conditional logic on the board, but they don’t have everything. 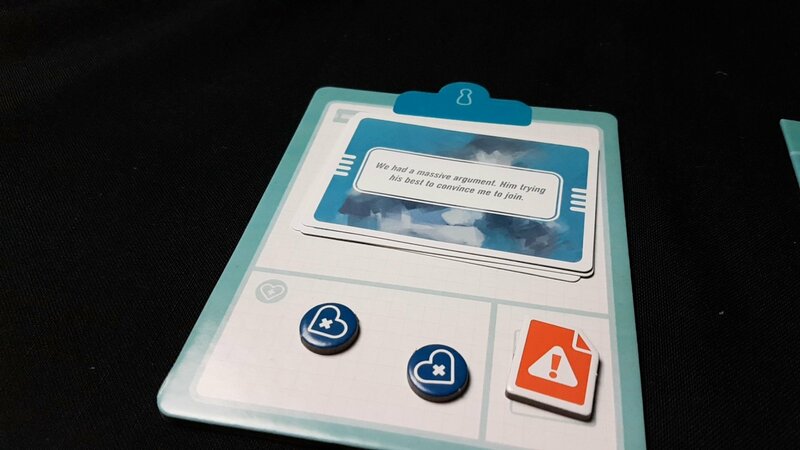 For example, the board shows that players get a care token at the end of the night shift but who actually gets them depends on how the shift has been setup. Similarly rules for covering shifts and the like are more restrictive than just ‘move a pawn and gain a stress’. Covering an additional shift can only be done if that pawn was on the previous shift, except in a two-player game. Stress also results in partial or clear memories being discarded from play. Nurses with two or more stress can’t actually inquire of Billy’s memories. They also can’t call his relatives if that must be done. The rules are quite intricate in other words and actually calculating the impact of a decision can be very complex and must often be done with imperfect information regarding what is left to come later in the day. Coupled to this, dealing with events requires reference to a short but cognitively complex list of icons (used in compounds) and cross-referencing these to Billy’s current state of health. There’s a reasonable amount of literacy required in play – memories often come with little fragments of exposition, and the scenarios likewise come with expository text that should be read to the table. Numeracy is handled primarily physically, replacing calculating with the covering up of icons with tokens. What matters more is an understanding of probability and a fair knowledge of the deck. Key to playing well is anticipating the odds that a shift will come with disaster and knowing when all the worst things have already happened. Importantly too, the full consequence of decisions you make will only ever be known too late to change them. When you over-stress a member of staff to the point they can’t come in the next day you’ll only really feel the pain when you have to deal with their absence. An interesting feature of Holding On is that it is immensely enhanced by an understanding of a very particular time in Northern Irish history. Memories reference real life cultural traditions, real places, real music, and real events. It was a time period too of particular strife and conflict and that seeps into almost everything you’re likely to discover. You don’t need to be a student of the Troubles, the Ulster Defence Association or the provisional IRA to get a lot out of this, but it might otherwise come across as a little strange and alien for those that don’t remember when the poisonous drumbeat of sectarianism was the constant soundtrack to the news. Geographical context also matters – the emotional implications of the story will vary depending on where you are in the world. Do you remember when Gerry Adams used to be dubbed over with a voice actor when he was shown on television? If yes, you’ll probably get a lot of the various references in the game. If not you might be a little too chronologically or corporeally distant to really get the full impact. Holding On’s memories are embedded in a time and place where he was less an avuncular uncle of Irish politics and more like an enemy of the state given begrudging airtime only over the objections of the Government. You don’t need this awareness for the game to be worthwhile. It’s an intensity multiplier. The IRA/UDA reference is not merely fluff in the section above. We’ll recommend Holding On in this category, for both of our categories of cognitive accessibility. The fact it’s a co-operative game alleviates a lot of what would otherwise be critical problems. The scaffolding that goes along with consensus-decision making means everyone can be involved even if they don’t necessarily play a huge rule in choosing Billy’s care. Well… you probably got a fair taste of where I’m going to land on this in the review. 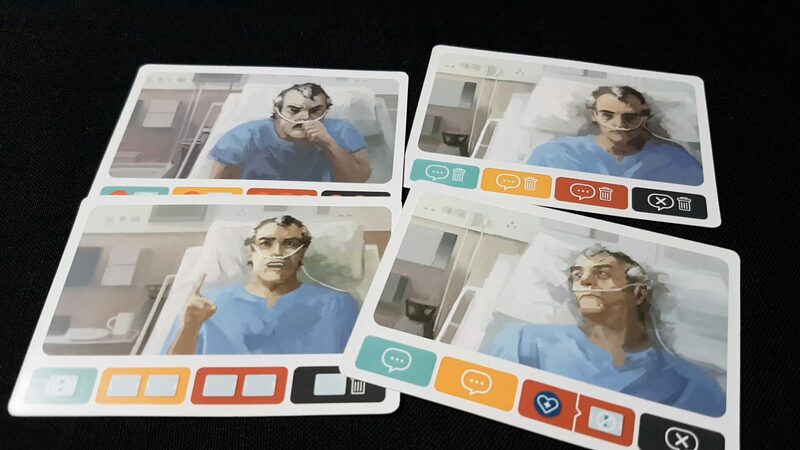 Holding On is a game about confronting palliative care from the perspective of being an overworked carer in a system designed around ruthless optimisation. I don’t know how accurate it is with regards to what it’s like to be a medical professional working in this kind of context. I can say it felt very accurate from the perspective of someone who watched his father die at home. I was never upset playing Holding On – there’s just too much you need to be doing to keep on top of the situation. It did make me think an awful lot about my father’s final weeks though and those were the weeks I’d like to remember least. When I think of my father I like to remember him when he was a living force of nature, not how he was in his final hours. Holding On, in its aftermath, made me think of that a lot more than I would have liked. I have seen testimony from a lot of people that suggests they don’t want to play the game because they fear the emotional damage that they could do to themselves. They’re mourning people who died more recently than my father, or they are in the middle of a palliative care process of their own. I think of playing Holding On with my mother and I go cold. It’s a game I won’t ever play with her. It’s a game where it might be difficult to get a group together, given how some people involved may need to be prepared to confront some dark memories. Nobody gets through life without loss, although a specific loss is incompatible with playing Holding On is a more difficult question to answer. But the point I made in the review is that this powerful emotional aspect of playing Holding On is not a bad thing. On the contrary, it’s a brave experiment into creating a game with meaningful emotional resonance. It’s a game that can be cathartic, but only when played with a suitable sense of how it works and what it’s likely to do to you. I’m sure lots of people will be able to treat it like a game without confronting any of this. All I’m saying is – be prepared when you go in. Billy Kerr’s story isn’t necessarily the easiest in the world with which to empathise but he’s a man facing his death in the sterile loneliness of a NHS ward and nobody who should care about him does. If you are stoney enough to face a game like this without flinching, there are numerous other things I might caution. The first is that this is a difficult game where often the random draw of the cards will be the thing that stands between you and success. Mrs Meeple and I failed the introductory tutorial. It’s possible for Billy to die without you being in a position to prevent it, and often the crisis management you do throughout the game leaves you without time to actually progress towards the scenario’s goals. Mistakes will have a long half-life – over-stressing a single pawn to the point it can’t come back into work will have ripples that impact on the entire rest of the game and you’ll likely never get a chance to recover from that. On the other hand, the consequences of not over-stressing nurses can likewise be too much to bear. You’re often forced to select between multiple terrible courses of action, sometimes several times in the one day. Some of the later relevations in the game are… politically charged. These are great for starting interesting conversations but they might become too interesting. British and Irish people of a certain age almost certainly have strong views about the Irish Republican Army. Later parts of the game will likely bring up disagreements about the morality of Billy Kerr himself and the role of the British in the Troubles. At a family party in my youth I remember an older relative almost throwing a punch at my uncle’s friend for saying that the British should leave Ireland to the Irish. This isn’t likely to be an issue these days but if you’re older than a certain age, and certainly if you grew up in Britain, these are occasionally controversial topics. I can’t at all recommend Holding On in this category, but in the end it’s going to depend on you and the people with which you’ll be playing. 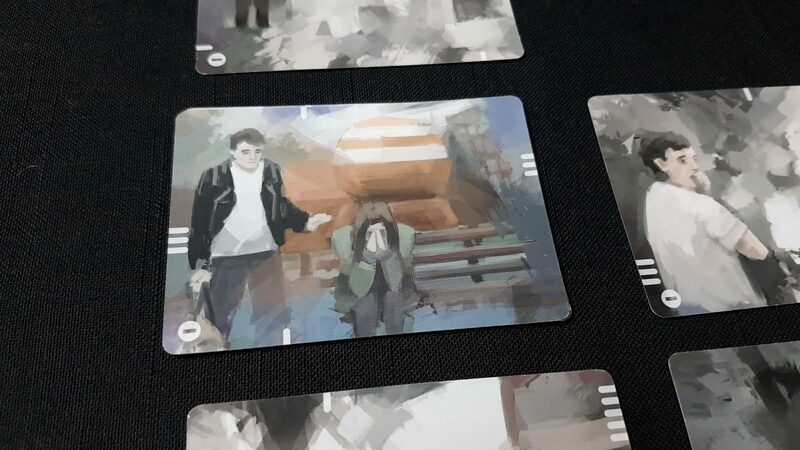 There’s a reasonable large amount of physical interaction required – dealing out cards (done by the senior staff member), drawing and placing memory cards (done by someone that isn’t the inquirer), matching clear cards to unclear cards, placing stress tokens on pawns and care tokens on cards. None of this has to be done by a player with physical accessibility needs, and almost everything is easily verbalizable. The exception here is in matching memories, although these will inevitably fall into a row/column setup that permits referencing. The issue is that orientation matters hugely in being able to match memories up, and the consequences of missing a match are significant. You lose the chance to make that memory clear and often the margins of play are tight enough that a lost opportunity means a lost scenario. 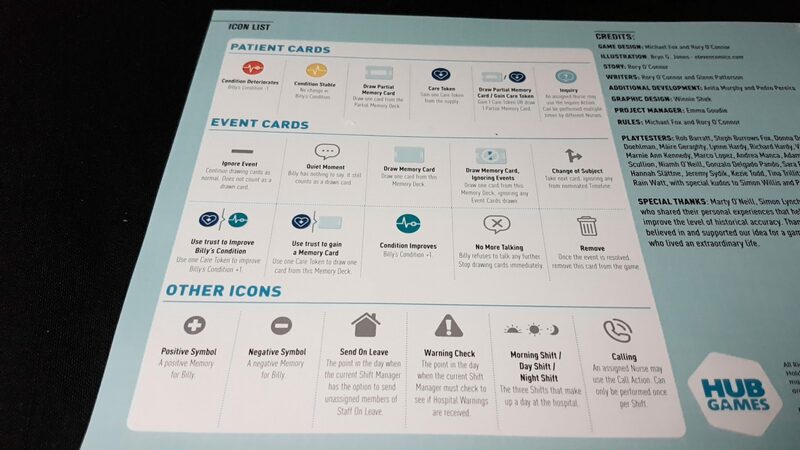 The shift manager, when they take control of their shift clipboard, will usually be balancing a few tokens on it – shared care tokens and hospital warnings primarily – and these are easily dislodged. We’d probably have a less positive recommendation if this were a competitive game, but the co-op nature gives players a lot of control over how the physical manipulation of the game is to be distributed and in any case a player can do perfectly well with verbal instructions. We recommend Holding On in this category. Obviously for a game about a character called Billy Kerr, the majority of the art in the game revolves around a older white man. His memories though include numerous other characters, including friends, children and romantic partners. I think though this is a story that needs a male character given the fact it references a particular historical context, story and relationship within a family. This isn’t ‘male by default’ but rather ‘male because it’s necessary’. The manual makes use of inclusive language throughout. 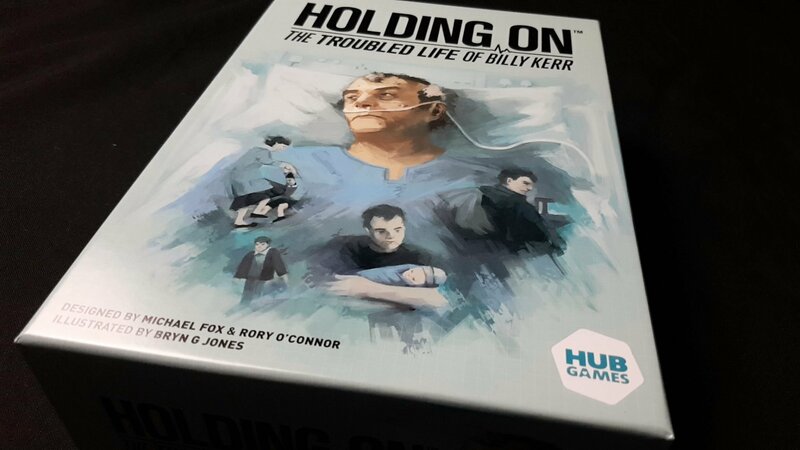 Holding On has an RRP of around £31 and Hub Games shows again a striking willingness to go against the grain of game pricing by focusing on affordability. You’ll get a lot of play-time out of the game, as it comes with ten replayable scenarios and when you’re done you can repeat if you like. It supports between two and four players, and works well at all those player counts. However, there is a complicating factor here in that as I mentioned above… it might be a tough sell for game night. That said, if you’re confident you can find people willing to play it I can’t fault it on price, value or representation. We’ll strongly recommend it in this category. 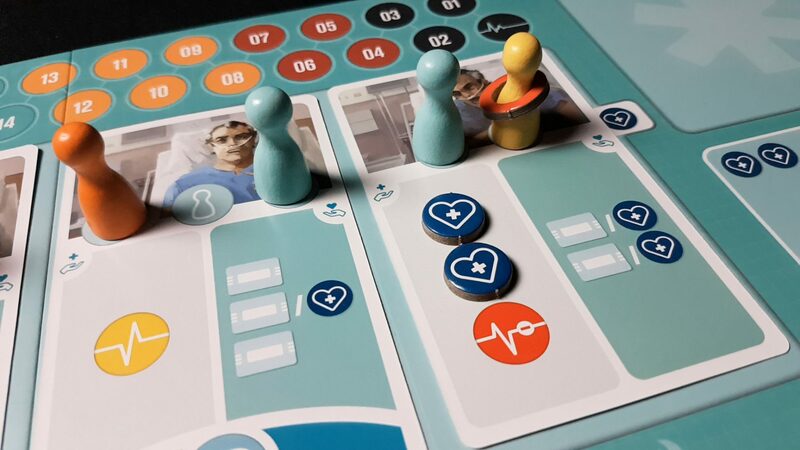 Holding On requires a reasonable amount of literacy, and while it’s possible to play the game without discussion and collaboration it would be dramatically lessened as a result. That said though, the conversation isn’t required to be confrontational and makes use of language and terminology that is part of an every day vernacular. As long as everyone in a group has a common method or methods of communication Holding On shouldn’t put any additional stresses on anyone. We’ll tentatively recommend Holding On in this category. Depending on the nature of cognitive impairment, the potential for upset is quite high. You’re dealing with a distressing theme, combined with an extremely challenging scenario based system, and revelations later on that texture the nature of Billy Kerr himself. It’s not that he’s a bad man, but rather a complex man that has done bad things. The cultural touchstones in the game are great conversation starters, but those conversations are likely to get dark and they require a reasonably sophisticated understanding of geographical and socioeconomic factors to put them in appropriately nuanced context. In other words, explaining some of the game might be a cognitive challenge in and of itself. It’s possible to explain the game in such a way that makes someone upset even if they didn’t start off that way. There are other things that we might point out as being potential problems, but the co-operative nature of the game itself is a major alleviating factor. For example, an intersection of cognitive and visual impairments would be a major problem for dealing with unclear memories but hopefully there’s someone at the table that can compensate. However, almost every category here has an upward lift because of the co-op nature of the game and people should be critical if they are playing in groups where assistance is not likely to be available. 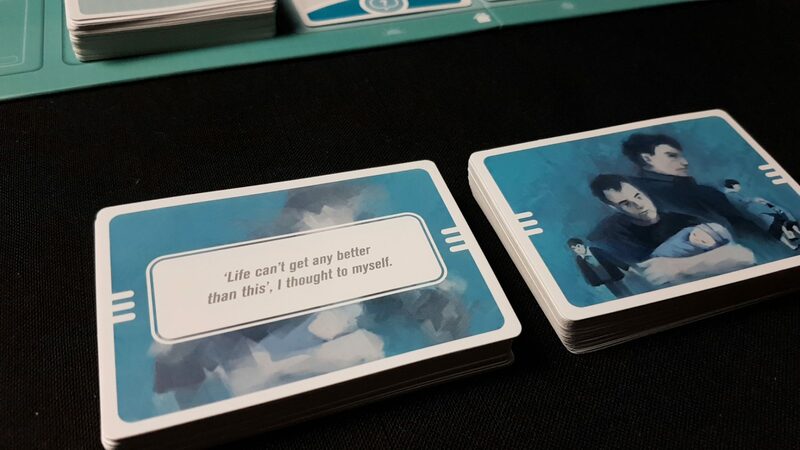 Holding On plays through a scenario in about 60 minutes, but you shouldn’t necessarily expect to succeed the first time. Several of the scenarios are challenging – we failed the first one, for example. Luck plays a big factor here – if you get lucky with card draws it’s straightforward. If you get unlucky you might well find success getting farther away with each new shift. As such, while the game is only sixty minutes or so (barring accessibility considerations) you might have that same sixty minutes several times. Holding On: The Troubled Life of Billy Kerr explores some interesting territory here – one of the reasons why I have been anticipating its teardown since I first heard about it. It took me on a tough emotional journey, but I can’t guarantee it’ll do the same thing for you. I can’t even tell you whether that’s a good or bad thing. However, I think the game covers sufficiently difficult emotional territory that it deserves some serious consideration before you pick it up. It has a widely ranging conceptual landscape where real-life issues of loss, history, politics, and more come together into a charged whole. I think Hub Games have been immensely brave with this game, but that doesn’t mean I can recommend it without caveats. Holding On is one of those games that undermine my entire argument for why rating systems are, overall, good for reviewers. I gave it four stars in our review but they’re utterly meaningless for a game like this. It needs to be assessed and considered from a range of perspectives that do not lend themselves well to numbers. I’m very glad Holding On exists, and I hope in the fullness of time it’s recognized as a landmark title that meaningfully increased the average emotional complexity of the entire hobby landscape.